If I were to commission the design of a building - whether commercial or residential - I would vastly prefer the opportunity to walk in and around it before brick and mortar were employed, over looking at CAD animations and illustrations, a flat screen, or even a 3D printout. Wouldn't you? It is such an inexpensive step and so basic to our senses (including common sense!). Using virtual worlds to bring blueprints to life is not only possible but a daily reality in Second Life®. To me, it looks like the body of an acoustic guitar, or maybe a key hole, or perhaps it is a musical note. When I met with him just hours before the Metanomics studio he had created was about to have its public debut, I completely forgot to ask Keystone Bouchard (aka Jon Brouchoud) if he had implemented Feng Shui techniques in the design. My guess is that he did, whether he is aware of it or not. The thing just flows. Unless you’ve been living under a rock or are very new to Second Life, then you know that the secret sauce over at Metanomics - the talk show that explores the serious uses of virtual worlds – is its community of suits and geeks who are there to mobilize mostly biz and tech ideas through conversation, together with the occasional sprinkling of left brainers, a smattering of educators and hard-core scientists, and a dash of memes. It’s a hale and hearty concoction. Keystone and I had been chatting for well over an hour, with just one interruption (he had to step away from the computer to say goodbye to his grandmother who was visiting his Real Life home – a real family man! ), when it occurred to him to share with me that he’d been notified minutes before our meeting that his Studio Wikitecture, which he co-founded along with Theory Shaw (aka Ryan Schultz), had just won the Linden Prize: $10,000 USD for developing an “innovative in-world project that improves the way people work, learn and communicate in their daily lives outside of the virtual world.” And that should give you an inkling of the kind of fellow we’re talking about here. Founder of the ARCH Network, a community resource for architecture and virtual worlds, including consultation, training, virtual design, BIM/CAD model import, and hosted Virtual Project Spaces. He created the Reflexive Architecture installation, where I first discovered and fell head over heels for virtual architecture. Keystone began the design process for the Metanomics building in February, and it had its unveiling on May 6, 2009. Here is the transcript of our conversation just before the opening. Would you say that this was the most complex project you've taken on? Keystone Bouchard: It wasn't terribly complicated from a functional perspective, since the intended use of the space was very clear. As far as complexity, I would say the Linden Lab HQ 4-sim project I worked on in 2007 while I was working with Clear Ink was quite a bit more so - given the magnitude of different program elements it had to accommodate, and the functional goals were much more difficult to quantify. Who was on the Metanomics team to create this space? 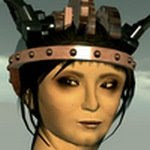 Keystone Bouchard: Discord Schism, Metaverse Engineer, and Dusan Writer were the main collaborators. I was responsible for conceptual design, Dusan designed the set, Metaverse Engineer did all of the landscaping and various detail elements, and Discord Schism built out the event partner hub and other detail elements. Joel Savard was the Project Manager. I also did 99% of the construction on the main building shell and most of the texturing. Keystone Bouchard: My brief was to provide an event space for Metanomics that would span 2 regions - the set on one (to help resolve lag issues), and audience on the other, and also to provide space to display additional content - material from past shows - and design for the site to scale over time, with additional buildings to be added later. My goal was to design something that everyone could feel comfortable with, and to invite community wide feedback throughout the design process. We had regular community forums, where we solicited feedback, and presented the design's progress. One of the things I observed before starting this project was that Metanomics can be as much about the back-chat as it is about the show itself. So many people expressing so many different ideas and opinions, yet, they're all coming together at that moment - around this show. I wanted to design something that was a visual metaphor for the coming together of ideas – the coming together of the community - so, the early conceptual designs were very literal. There were lots of building pieces coming together from all different angles - to create the auditorium. In the final manifestation, that visual metaphor was represented with structural columns, while earlier on it had been more literal. It became a much more subtle expression, as though there are many individual pieces that are working together. None of them could visually support the structure alone. How was this experience different from designing in Real Life, other than taking backchats into consideration (although nowadays twitter IS the equivalent of backchat in Real Life)? Keystone Bouchard: It was much easier to express the idea here. In Real Life - conveying a design is a very abstract experience. You're sharing 2D plans, or sketches, and trying to imagine what it will look like - and trying to help the client imagine what it will be like, so, you're always trying to build a portal into that dimension - and show them that world - like from the outside looking in. So how does the experience compare directly with CAD? Keystone Bouchard: You decide, at some moment in time, to take a look at what the design will actually look like; whereas here, it’s always there… constantly. You're always in real-time 3D. There's never a moment when you have to stop and say, “Ok, let’s look at it in 3D.” It’s always 3D. How often do those moments come up in a Real Life situation? Keystone Bouchard: That's the other part of it. The client only gets to see your progress at bi-weekly meetings. Here, the client can make an appearance at any given moment. And that is just the design process. Some designers might consider that unnerving - but I find it to be invaluable. I like sharing the burden! If I'm stuck on something, I love being able to bounce ideas off of people. It becomes much more efficient because I’m not working in some direction for two weeks and then showing it to the client. At what point in the design process did you introduce the stretched canvas texture? Did you originally think in terms of canvas? I'm reminded of Franklin Lloyd Wright and also Paul Klee. It seems organic, like a skin. Keystone Bouchard: Yes, I've always been a fan of the idea of translucent marble that is cut so thin that light can permeate. It is possible to do in real life, but incredibly expensive. The idea with the outer shell was for it to be 'skinnable.' This is just one possible solution, but I hope in the future that it can be re-skinned with other textures: perhaps dynamic, maybe reflexive, or maybe (it) changes color based on concurrency or the mood of the community - like a visual display. Keystone Bouchard: Yes, maybe something about the upcoming show; maybe competitions to design the best skin. Whatever the result, the goal was to make it very flexible. What was the stickiest point? Keystone Bouchard: Scale. It is still a challenge. I think the seats are too far away from the set, for example, because I wanted it to feel intimate, yet, it has to accommodate a large and growing audience. Is that for purposes of the studio cameras? What percentage of the design discussions took the camera into account? Keystone Bouchard: Camera had a lot to do with it. I was told 'no alpha' early on. I designed an inner shell where the camera is, for the lion's share of the show - with no alpha - so I could get away with having an alpha outer shell. Keystone Bouchard: NPIRL ;-) (Not Possible IRL). At one point, the idea was for the build to start very “Real Life” at the base - where it meets the ground - as though there were already this kind of historical archeology - and building over the top of that as it rises in the Z-axis, it becomes increasingly NPRIL. The idea of NPRIL came up dozens of times in design iterations. At one point, I was talking to Scope Cleaver (another virtual architect) about this. I pinged him often during the course of design development, and he said, “Wouldn't it be cool if the building were actually rising up out of the ground - as though the community were a kind of current - and this building was picking up on that, and crystallizing around it?” A brilliant idea, but as I thought about it, it’s more like something that zips around and orbits. Later in the conversation I learned of Studio Wikitecture's Linden Prize win, and of course, I had to ask about it. Keystone Bouchard: When we first started brainstorming the idea of applying principles of open source, and Wikipedia-style collaboration to architecture and the built environment, we knew that Second Life was exactly what we needed to make this work. The ability to customize and program elements within this platform was huge. We were able to build the Wiki-tree here, using this platform, and do lots of unique things with it, like being able to tie it in with a website. The diversity and size of the community is requisite in collaboration like this. Also, prims - believe it or not, prims! - are an important part of why Wikitecture works in Second Life. They're granular, so individual parts of the design can be modified, and the building tools are easy to learn. That's why Second Life became a platform for experimenting with an augmented form of architectural collaboration that I sincerely believe could be an improved design methodology - and a more effective means of harnessing the collective wisdom of communities - the people who actually use architecture and the built environment. Buildings are just too big, and too complicated for a single firm or individual to fully comprehend and, ultimately, the urban fabric is a lot like one vast operating system upon which we run our lives. Linux was developed by many, many people - maybe architecture can be, too. How radical is this thinking in the architectural community today? Keystone Bouchard: O'Reilly called it 'Radical Collaboration' - so - I guess it is radical. There is no other platform that offers this combination of features - the simple building tools, the immersive, realtime, multi-user experience - the ability to program a technology plug-in into it - and more - because of the fact that this combination doesn't really exist in other software applications. There isn't anything quite like it. About a year ago... at least that is how I recall it... you seemed to be going through a period of real disenchantment with Second Life and virtual worlds. I felt as though you were... disengaging. Is this true and what happened that changed that? 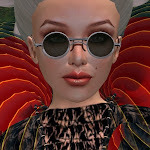 Keystone Bouchard: When I started using Second Life, I was most impressed by what I assumed it was 'about to become' - not necessarily for what it was. I saw it as a tool. A platform. I knew an environment like this could be powerful in architectural and AEC practice, and I couldn't wait until X, Y and Z feature were implemented. I kept saying, “Imagine what this will be like in a few years!” After two years, it started to feel like nothing had changed and nothing was really getting any better, but that's when a kind of transition occurred and I started to think of it more like a place than a tool. It was then when I began to appreciate it for what it is - not for what I hope it will someday be. I think the fact that it has this 'real life' association - the land, the sky, the human avatars - is why we get disappointed with it when it isn't Real Life. We're comparing it with the physical world, when it really is a place, a context, and an environment all its own. You can teleport to the Metanomics building directly from here.